Championship Park is right across from University of Houston Downtown, on the north side of the Main Street Bridge. 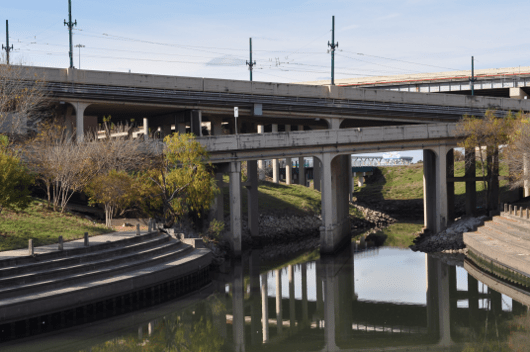 This park is on Buffalo Bayou and includes the bayou bike trail, terraces and close access to the water. 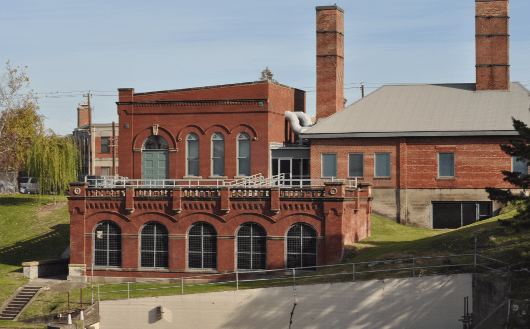 It is right behind the historic Willow Street Pump Station that once served as crematorium, sawmill, and, of course, pump station. From the street, you don’t even know the park is there. Once you find it, you can’t believe you have been driving by for years. Or at least this is how I felt. I found the park on THIS Downtown map and set out to find it. We parked on San Jacinto by the METRO Police Headquarters. (Street parking is available and is free after 6:00pm and on Sundays.) 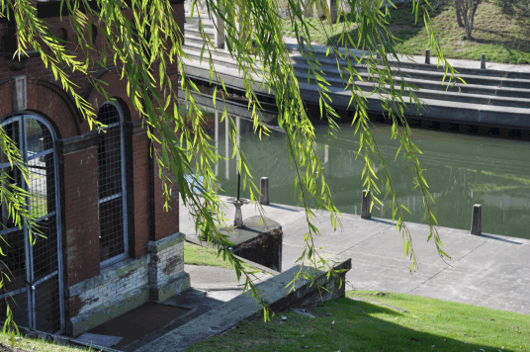 There is a nice paved path to the park on Wood Street, but we did not know this at first, and went down the steep grass behind the pump station. From the pump station, we saw the most beautiful picture of Houston. 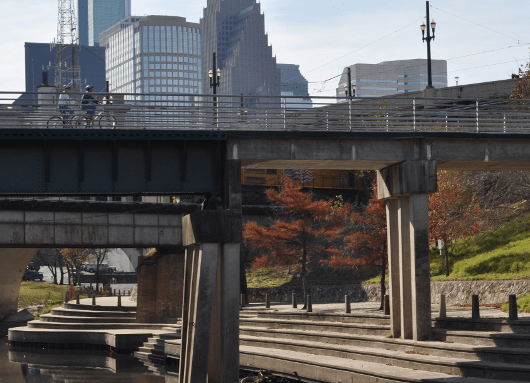 The sun was shining, the view of the skyline was fantastic, the hardscape around the bayou was perfectly maintained, bike riders was crossing on the pedestrian bridge above us AND there was a freight train right over the water. 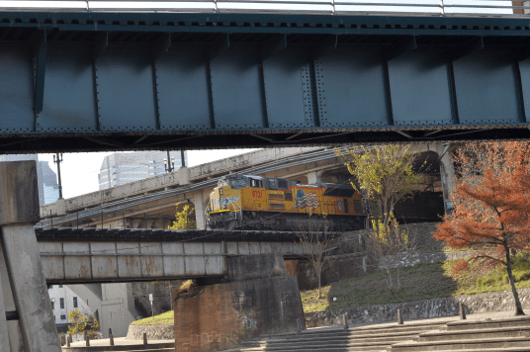 AND METRORail was passing right over the the Main Street Bridge. I’m not joking about this being perfect. 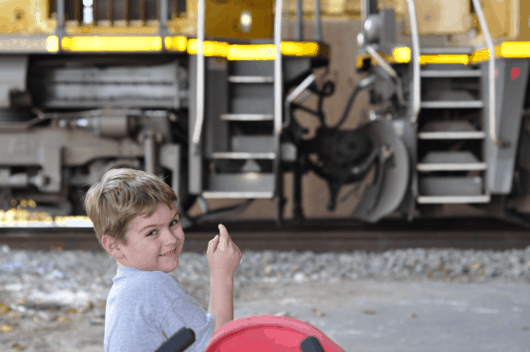 My kids love trains and we had lots of them. And the freight train was parked! We walked along the trail, got dangerously close to the water, and ran back up the hill to see the park from another angle. Back up the hill, we ran over to the pedestrian bridge (by the train tracks). 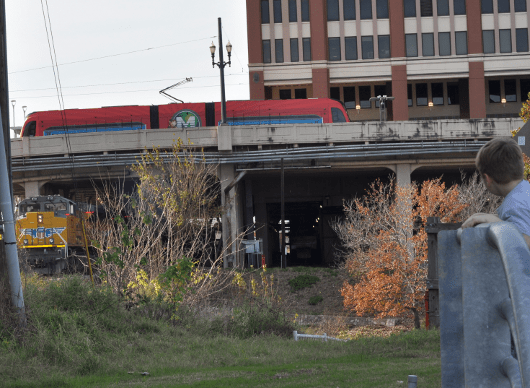 Here was stood and watched the parked freight train, under the University of Houston building, for a long long time. The only problem was that James wanted to actually get on and drive the train, that was parked over the water, and was mad mad mad when we told him “no”. This park does not have a playground, or even green space, but it is really beautiful and fun to explore. It is several stories down from the street, which always concerns me. The park was empty when we were there, but for safety, I would take another adult with you. There are no restrooms, but this trip should not take too long. Go explore Championship Park or take your bikes down the long Bayou Trails. Joe hopes you find a freight train!